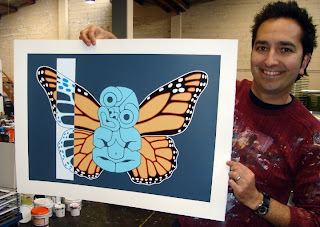 Auckland printmaker Brad Novak's print Tiki with Danaus Plexippus Wings 1.1 was the first edition by this talented NZ printmaker - and now it is the first print edition by Novak to sell out. Just two prints from the edition are available nationwide this morning, one of which is in stock at New Zealand Fine Prints. In May Novak completed his latest print "Reservoir Dogs of NZ" - an idea that came to him while on holiday in the UK. Brad says he is really happy with the final artwork for Reservoir Dogs of NZ - he "tried lots of different birds before settling on the combination I did" - deciding on the Tui, Kiwi, Whio, Huia, Shag and Albatross in a print that also references the Waiting for Buller series of paintings by Christchurch painter Bill Hammond.